HealthWatch Pro is designed for health professional. It can calculate growth percentiles, blood pressure percentiles, and BMI for children and adults. HealthWatch Pro can also evaluate underweight and overweight, identify metabolic syndrome and calculate risk for having a heart attack using the algorithms from Adult Treatment Panel III. HealthWatch Pro provides tools for import/export data from Excel, and allows input/ouput wider range of data. Calculate and track growth percentiles, BMI, and more. Print CDC growth charts. ...... you to input information such as your name, age, gender, weight, height, blood pressure, and cholesterol level. Once you enter all data and hit the Save and Calculate button, HealthWatch Pro will generate facts such as growth percentiles, your BMI and risk of heart attack. 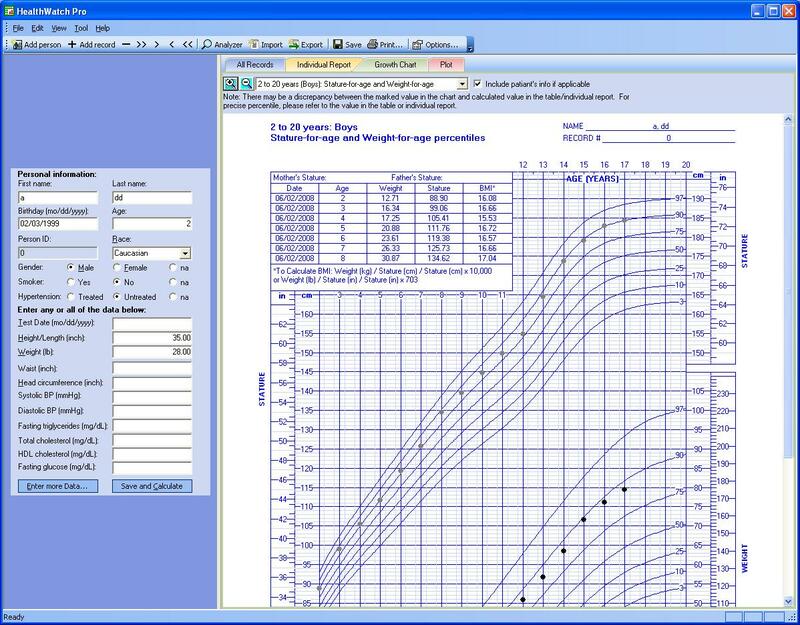 * Showing and printing growth charts: HealthWatch Pro can show and print all growth charts published by CDC, and automatically add patient's information on growth charts. This feature dramatically saves your times in data analysis with growth charts. HealthWatch Home allows plotting growth data so as to show the changes against time, or the relationships among growth variables. * Providing summary report: HealthWatch Home shows data and calculating results in a summary report with HTML format. This allows you to share your report with others easily. Qweas is providing links to HealthWatch Pro 2.2 as a courtesy, and makes no representations regarding HealthWatch Pro or any other applications or any information related thereto. Any questions, complaints or claims regarding this application HealthWatch Pro 2.2 must be directed to the appropriate software vendor. You may click the publisher link of HealthWatch Pro on the top of this page to get more details about the vendor.